A SPOTLIGHT Special Presentation! Armed with a sassy-silliness and a g-force of glitter, these girls pack a sparkly punch that will make your heart happy and leave you loving the skin you’re in! Click below to view the video. The Vernon and District Performing Arts Centre Society proudly presents On Stage Concert: Kim Churchill on Sunday, November 4 at 7:30pm. ONE NIGHT ONLY! With the audience seated cabaret style on stage, our SPOTLIGHT On Stage Concert Series allows for audiences to relax and enjoy an up-close and personal concert in this intimate venue. A SPOTLIGHT Theatre show! 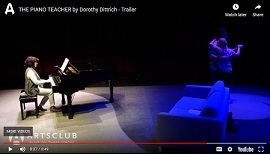 From Arts Club Theatre: A concert pianist hasn’t touched a piano in years following the loss of her husband, until a piano teacher gently reacquaints her with the instrument, and brings into her life the healing power of music. Of all the musical settings of the Latin Mass for the Dead, Verdi’s ‘Requiem’ is the most iconic. By turns dramatically terrifying and transcendent, it is often called ‘an opera in disguise’. With four of Canada’s leading operatic soloists, a massed choir of 150 voices and the full power of the OSO, this performance will deliver an exhilarating experience. November 2018 marks the centenary of Armistice Day and we commemorate this historical occasion with the Okanagan premiere of this masterpiece. A SPOTLIGHT Dance show! Ballet Kelowna returns with their signature contemporary ballet style featuring the company premiere of John Alleyne’s lyrical and athletic Schubert, and two works by Alysa Pires, including the reprise of audience favourite, MAMBO. This unique production was inspired by the classic Chinese legend and uses a dynamic fusion of drama, dance, music and acrobatics to relay a captivating story! This exciting trio bring a superb level of excellence to their virtuoso arrangements and original pieces. Jaffray, B.C.- born, singer Dean Brody is coming to Vernon with his Dirt Road Stories Acoustic Tour.